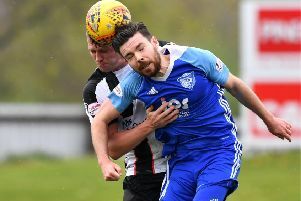 Peterhead’s 1-0 win over Annan on Saturday brought them to within three points of the top of the Ladbrokes League 2 table. A stunning Rory McAllister free kick on the stroke of half time gave the Blue Toon all three points at Balmoor while league leaders Stirling Albion were beaten 2-1 by Stenhousemuir to see their lead at the top of the table cut to just two points from second place Montrose and three from Peterhead in third. “It was a big three points.” Said Blue Toon boss Jim McInally. “When its only one nil you can guarantee the other side are going to get chances and the one that hit the post near the end, Greg would normally have come out and cleared it but the wind made it difficult. “You couldn’t tell how bad it was from the sidelines but we certainly didn’t need a left winger today that’s for sure!. “We rode our luck in the first half then cleared the ball off the line from the corner kick and it was a good three points. “Mason Robertson made one mistake near the end but that was the only one he made all game and I thought he was terrific especially as he’s been out for a few weeks. “Ferry and Gibson were also excellent but the weather won the day and it certainly wasn’t a classic. “The goal was typical of Rory and we’ve seen in other games here this season that we couldn’t kill the opposition off but we got away with it today. “We need to make sure we see the game out better and get another goal in situations like that. “I wasn’t surprised that Stenhousemuir beat Stirling Albion as they are a good side and that has opened things up. This weekend Peterhead travel to face Elgin who themselves are only two points behind the Blue Toon in fifth. Stirling are away to Edinburgh City, Montrose travel to Cowdenbeath and Stenny host Clyde.